At Australian Hot Water, our online warranty registration is key to keeping you in hot water. Your warranty registration will provide a history of all the important aspects of your product or services. When you have made that important product purchase or service repair from Australian Hot Water, you can rest at ease. It’s a good idea to register the warranty of your purchase or service work so we can provide our service team with details at any time when the need may arise for a repair or replacement. With this information Australian Hot Water can keep check on when your product or service may require an upgrade or periodical service. All this knowledge may help to keep your valuable purchase lasting the test of time and keeps hot water flowing in you families home. 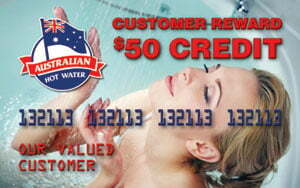 As a gift for your loyalty to Australian Hot Water, register online and you will receive a $50.00 credit voucher, for your next service, that can be used for any future repair or replacement hot water system, outside any manufacturers warranty period. Leave us a positive review on the Australian Hot Water Facebook page and go into the draw to win a $500 Webjet voucher. All applicants must email a copy of their review to admin@australianhotwater.com.au to go into the draw. Entries close 5th May 2018.